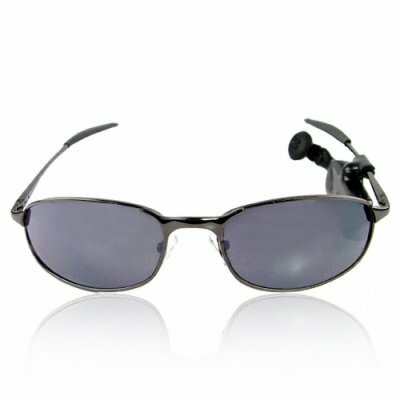 Successfully Added Bluetooth Earpiece Headset Clip-On For Sunglasses Or Glasses to your Shopping Cart. Versatile Bluetooth earpiece for handsfree calling on cellphones, with a clip on design for use with most sunglasses or glasses. This lightweight, compact Bluetooth unit can convert your own choice of eyewear into a cool wireless gadget, and comes ready to use right out of the box with a pair of stylish black sunglasses. This wholesale Bluetooth gadget apparel device features such cutting edge technology as headset and handsfree profiles for easy use with your mobile phone, as well as A2DP profile for listening to music straight off a phone, a long lasting battery, and a built in MIC for easy handsfree talking. A perfect accessory for both communication and for style, available now from China with no MOQ and Chinavasion's one year warranty.. Even lower prices available for you if you're ordering in larger wholesale quantities. Get your samples first then contact us for your personal discount quotes! If you wish to make comments or reviews about this product, please use the product review. Please open a enquiry ticket if you have questions.